Yes, I am a rebel. Yes, I am a dissident. Yes, I am disobedient to people like those Bugninis. For they have infiltrated themselves into the Church in order to destroy it. There is no other explanation. Are we then going to contribute to the destruction of the Church? Will we say: "Yes, yes, amen'; even if it is the enemy who has penetrated right to the Holy Father and who is able to make the Holy Father sign what he wants? We don't really know under what pressure he did it. There are hidden things, which clearly escape us. Some say that it is Freemasonry. It's possible. I do not know. In any case, there is a mystery. How can a priest who is not a Cardinal, who is not even a Bishop, who was still very young at the time and who was elevated against the will of Pope John XXIII (who had chased him from the Lateran University), how can such a priest go to the very top without taking any account of the Cardinal Secretary of State, nor of the Cardinal Prefect of the Congregation for Worship? How can he go directly to the Holy Father and make him sign what he wants? Such a thing has never before been seen in the Holy Church. Everything should go through the authorities. That is why there are Commissions. Files are studied. But this man was all powerful! It was he who brought in Protestant pastors to change our Mass. It was not Cardinal Gut. It was not the Cardinal Secretary of State. It was perhaps not even the Pope. It was him. Who is this man Bugnini? One day the former Abbot of St. Paul Outside the Walls, a Benedictine who had preceded Fr. Bugnini as head of the Liturgical Commission, said to me: "Monseigneur, do not speak to me of Fr. Bugnini. I know too much about him. Do not ask me about him." I replied: "But tell me. I must know it. The truth must be uncovered." It is probably he who asked John XXIII to send him away from the Lateran University. All of these things show us that the enemy has penetrated right within the Church, as St. Pius X already said. He is in the highest places, as Our Lady of La Salette announced, and as without a doubt the third secret of Fatima tells us. Well, if the enemy is truly within the Church, must we obey him? "Yes, for he represents the Pope," is a frequent answer. First of all we do not know this at all, for we do not know exactly what the Pope thinks. 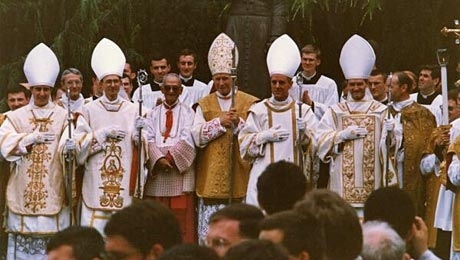 I have, all the same, some personal proofs that Pope Paul VI was very much influenced by Cardinal Villot. It has been said that Cardinal Villot was a Freemason. I do not know. There are some strange facts. Letters of Freemasons addressed to Cardinal Villot have been photocopied. I do not have the proof of it. In any case, Cardinal Villot had a considerable influence over the Pope. He concentrated all power at Rome within his own hands. He became the master much more than the Pope. I do know that everything had to go through him. One day I went to see Cardinal Wright with respect to the Canadian Catechism. I said to him: "Look at this catechism. Are you aware of those little books, which are entitled ‘Rupture’? It's abominable that children are taught to break away. They must break with their family, with society, with tradition. ..this is the catechism, which is taught to the children of Canada with the Imprimatur of Monseigneur Couderc. It's you who are responsible for catechism in the entire world. Are you in agreement with this catechism?" "No, no," he said to me: "This catechism is not Catholic" -"It is not Catholic! Then immediately tell the Canadian Bishops' Conference. Tell them to stop and to throw this catechism in the fire and to take up the true catechism." His answer was: "How can I oppose myself to a Bishops' Conference?" I then said: "It's over and done with. There is no more authority in the Church. It's over and done with. If Rome can no longer say anything to a Bishops' Conference, even if it is in the process of destroying children's Faith, then it's the end of the Church." That is where we are now. Rome is afraid of the Bishops' Conferences. These conferences are abominable. In France the Bishops' Conference has been involved in a campaign in favor of contraception. The Socialist Government, which is constantly advertising on the television the slogan: "Take the pill so as to prevent abortions," got them involved, I think. They had nothing better to do than push crazy propaganda in favor of the pill. The cost of the pill is reimbursed for girls of only twelve years, so as to avoid abortion! And the bishops approve! Official documents in favor of contraception can be found in the Tulle diocese bulletin, which is my former diocese, and which bulletin I continue to receive. This came from Bishop Bruneau, a former Superior General of the Sulpicians. He is supposedly one of the best Bishops of France. It's like that!